This exploration of effective practices to support lesbian, gay, bisexual, transgender, queer (LGBTQ) and gender-diverse students in elementary, middle, and high school contexts focuses on curriculum, pedagogy, and school environment. Narratives and artwork from the field are framed by sociocultural and critical theory as well as research-based elaboration on the issues discussed. Applications of antidiscrimination law and policy, as well as learning skills like creativity, collaboration, and critical thinking help teachers tackle some of the most significant educational challenges of our time. The stories of real-world practices offer encouragement for building inclusive environments and enhancing social-emotional relationships among youth, families, and schools. 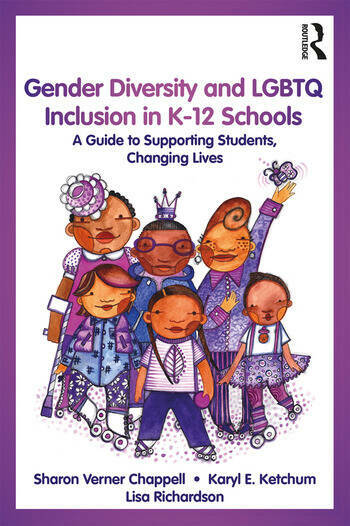 Gender Diversity and LGBTQ Inclusion in K-12 Schools provides a helpful roadmap for educators hoping to create safe and empowering spaces for LGBTQ and gender-diverse students and families. Sharon Verner Chappell is Associate Professor, Elementary and Bilingual Education Department, California State University Fullerton, USA. Karyl E. Ketchum is Associate Professor, Women and Gender Studies Department and Queer Studies Minor Program, California State University Fullerton, USA. Lisa Richardson is a recently retired Elementary School Teacher and School and Community Outreach Coodinator for South Orange County PFLAG, USA. —Therese Quinn is the author of Art and Social Justice Education: Culture as Commons (2012) and Flaunt It! Queers Organizing for Public Education and Justice (2009) and directs the Museum and Exhibition Studies graduate program at the University of Illinois at Chicago.